Hello! Today was a good day to stay cozy inside. It was a cold 27 degrees and snowy with more snow on the way. A great day to stay cozy inside and work on cards for upcoming birthdays. And here is one I made for my dearest friend. 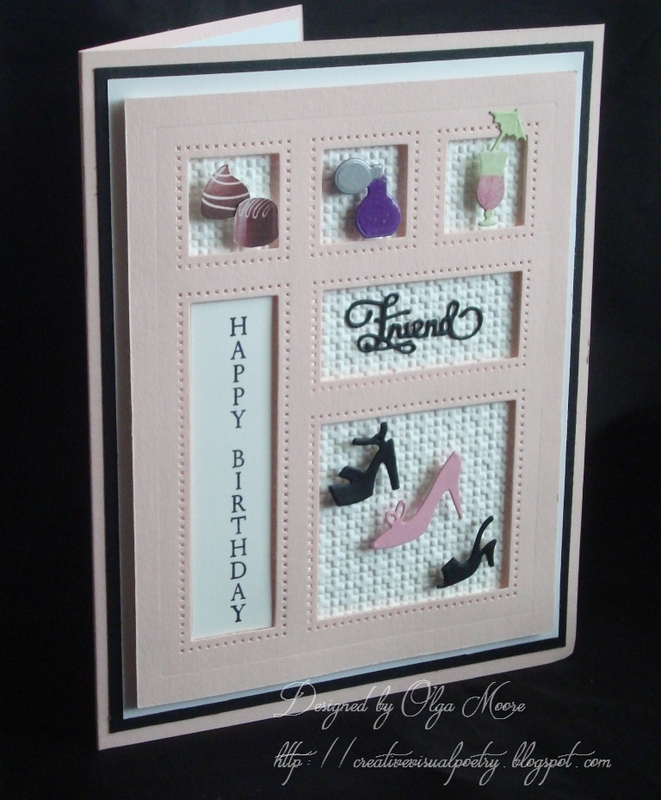 It's a shadow box card and I was so happy with the way it turned out. I began with the base card in PTI Sweet Blush card stock, layered it with GKD Black Onyx followed by GKD Pure Luxury White. This was put aside to work on my focal panel. 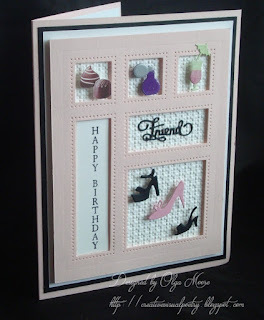 The shadow box was cut in PTI Sweet Blush card stock using Creative Expressions In the Garden Shadow Box die (a Sue Wilson die). Next, dimensional tape was adhered to the back of the shadow box and matted with a panel of white card stock which had been embossed with an SU Square Lattice EF. I cut out some small accessories to put into the shadow box: the chocolates were computer generated and cut out; the perfume bottle and 2 of the shoes were cut from Creative Expressions Retail Therapy dies; the cocktail glass was cut from IO Mixed Drink set; "Friend" was cut from the In the Garden Shadow Box set; and one other shoe was cut from IO Wedding Icons set. The perfume bottle was paper pieced and colored with Copics and the cocktail glass was colored with Copics and covered with vellum. The sentiment, from GKD Mountain Wilderness stamp set, was stamped in Memento Tuxedo Black ink and popped on with dimensionals. All the accessories were positioned in the shadow box openings with dimensionals and the panel was adhered to my prepared base. This completed my card. Thank you for stopping by! Hope you enjoyed this post and were inspired to create. Until next time, make it a great day! What a wonderful card and I love the shadow of design. I love all the great items you added to each box.